The third installment of the Dragon Age: Redemption series is fitting titled "Josmael", as the young, lovelorn Dalish mage turns the tide of the story with one fateful yelp. 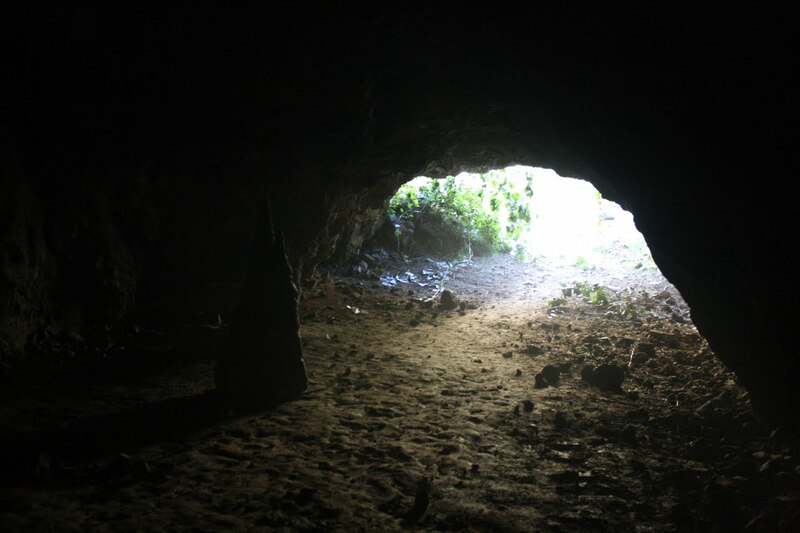 This blog finds both our heroes and villains in the hidden cave of an ancient Elven god, thick in the heat of battle. Photo 1: Right from the start of DA:R pre-production, the hunt was on for a suitable cave to film this episode in. The fight choreography was going to be quite elaborate, and there were very specific location based requirements for the scene to play out properly. 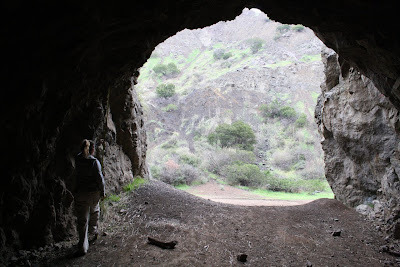 Unfortunately, there are not a lot of actual caves in the Los Angeles area! We discussed building a cave on stage, but the budget was too restrictive to create a space big enough to be effective. Another issue was that the scene was meant to be lit entirely by torch light. 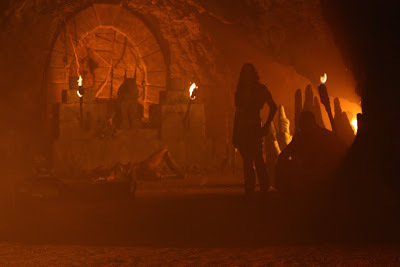 We were not permitted to have open flame on the stage, and the cave would be way too intimate to try and sell the torch effect with a lighting gag. Photo 2: Plugging up one end of Bronson Caves ended up being the most viable option, since it was local, cave like, and we could use fire! I will openly admit I was against the idea at first, since the cave is so over used for low budget, and because the interior texture is much more like a carved tunnel than an organic cave. But ultimately we were able to dress it properly, and make it look like a different place. 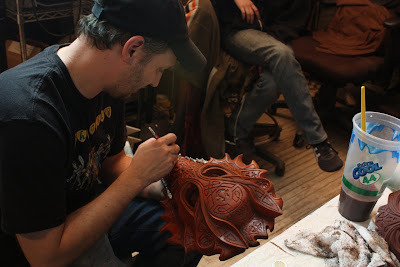 Photo 3: Our special FX supervisor carefully cut into our altar set piece to be able to run copper tubing from the torches to a propane tank, so the fire could be controlled safely, and burn for long lengths of time. Photo 4: The propane fire was smokeless, but the FX department ran a small hazer to add some density to the atmosphere. Combined with the heavily gelled amber and red lighting provided by Director of Photography John Bartley (The X-Files , Lost ), the mood was pretty convincing. Photo 5: Tallis's party sneaks into the cave from a small entrance at the far side, and take cover behind an upcropping of stalagmites. 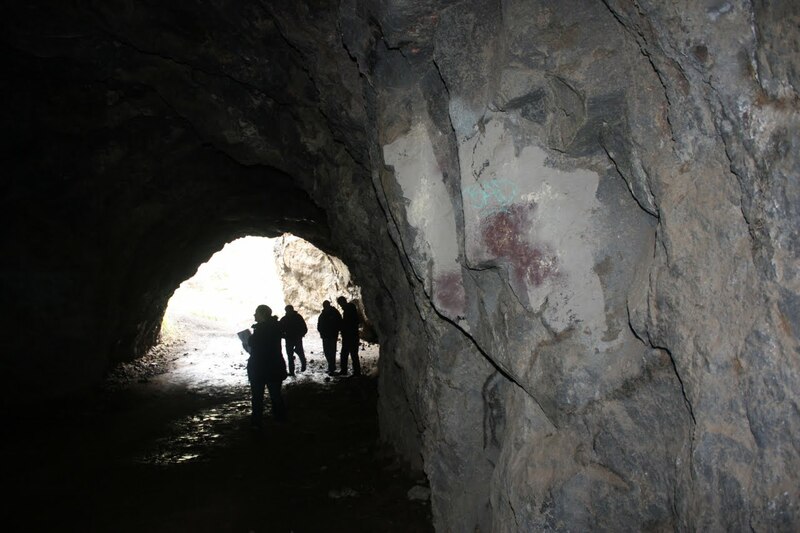 Photo 6: This entrance was actually a third opening in the tunnel, a small outlet that forked off the main thruway through the mountain. It was pretty small, and since this cave was built for the Batmobile to be able to drive through, the ground was very flat. Photo 7: You can see how adding a few shapes can drastically change the look of an environment. The stalagmites were carved from scraps of styrofoam glued around wooden frames. 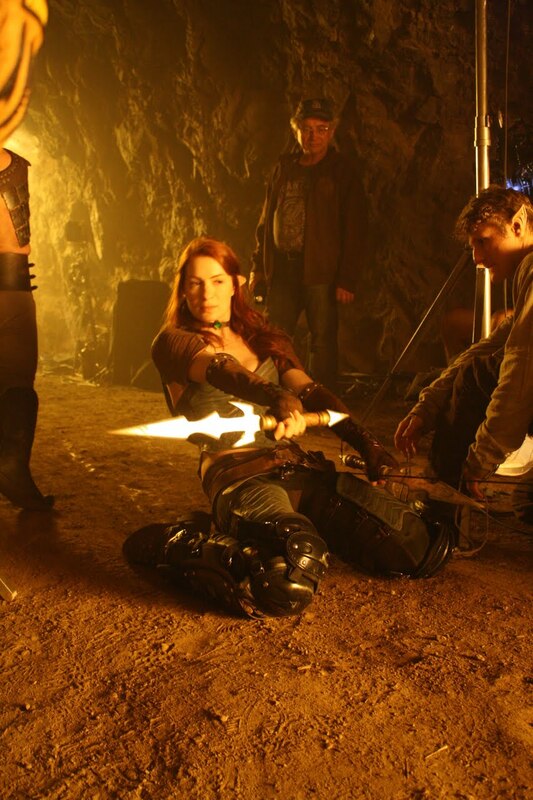 Photo 8: Felicia Day as Tallis, preparing for battle with the Reaver Nyree. Photo 9: But Nyree wasn't the only henchman in the cave. 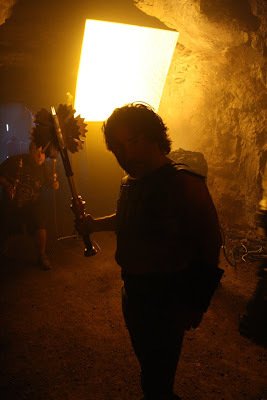 Tallis and Cairn had to fight their way through multiple obstacles to get to Saarebas, including the dwarf Rukk, portrayed by actor Michael Munoz. Photo 10: Rukk may not have been the tallest member of Saarebas's band of misfits, but he definitely was not light on battlements! We plucked this painful mace from the BioWare weapons chart, and Armorer Mazin Dajani carefully recreated it from plates of aluminum, welded into a ball of doom. 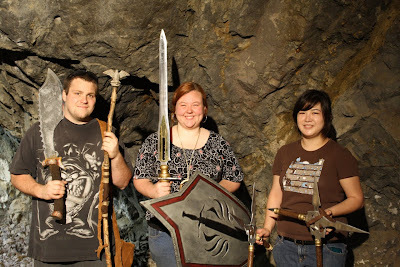 Photo 11: All the insane maces on the rack wouldn't save poor Rukk from the sting of Tallis's blade, though. Here, Felicia wears leg guards to slide under Rukk's mace, and deal a lethal blow and take the dwarf out. Photo 12: Felicia did a huge amount of the stunts herself, but for those few that were deemed too dangerous for the writer/actor/producer, a professional stunt double was brought in. We made a Tallis costume to fit Candace Hollinger, in which she pulled of some amazing stunt performances. 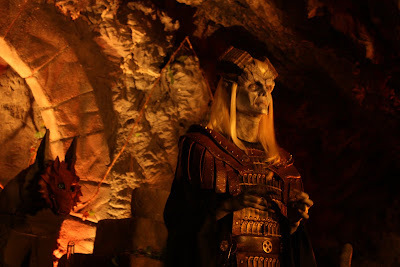 Photo 13: The Qunari mage's other rogues were a pair of stunt performers who also had strong acting backgrounds, so they were cast in the roles, and did their own fighting and stunts. 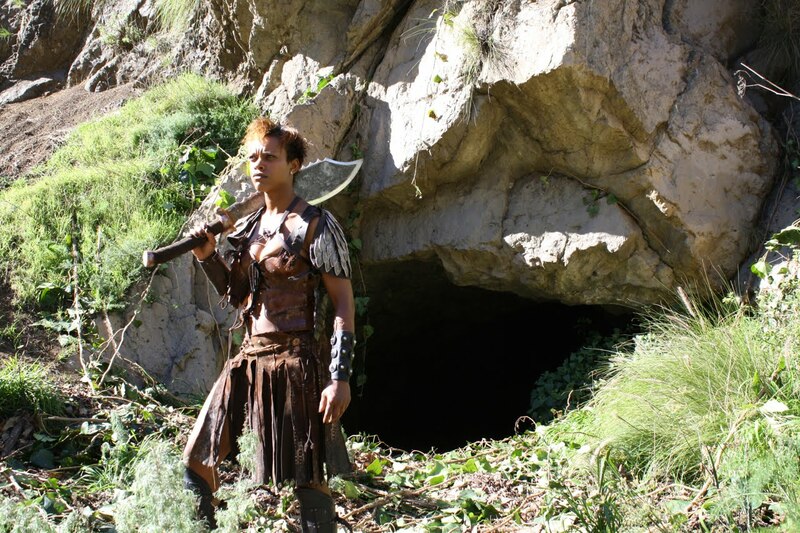 Alex Huynh played Ludd, who fought in an eastern style along side his twin sister, Lune. It was great to work with Tara Macken again. She actually did her first feature film stunt work as space infantry in my Sci-Fi channel movie Battle Planet . 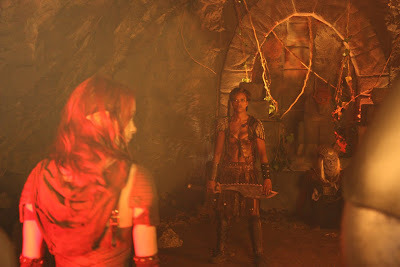 Photo 14: The rogue twins wielded mirrored weapons, fighting as reflections of each other. Lune held a sickle in her right hand, a hatchet in her left, and Ludd was the exact opposite. Here, Art Director Bryan Fulk holds a printout of the Dragon Age II game asset for the sickle. It was mounted on foam core, cut out, and held against the ruler for scale so Stunt Coordinator Thom Williams could sign off on the proportions before we started building the final prop. Photo 15: The hatched game asset sent to us from BioWare. I really enjoyed the solidity of this weapon. It looked like it was cast as one solid pour of heavy iron. 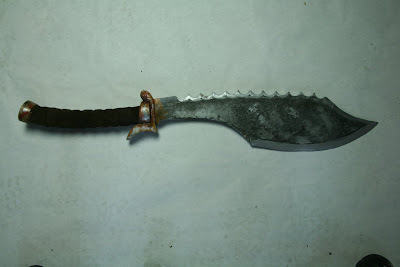 Photo 16: Here are the finished weapons as constructed by Mazin. The sickle blade was cut from a sheet of aircraft aluminum. I sculpted the handle to look like leather wrapped wood, but it was actually cast in a flexible urethane to provide some grip. The hatchet was cut on the CnC, molded, and cast in a light but durable rigid urethane with a wooden dowel run through it. 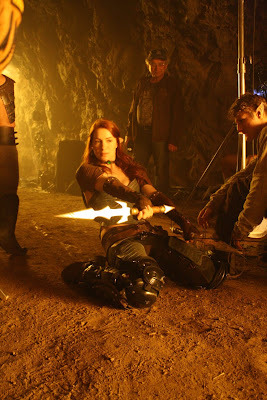 Photo 17: During the fight scenes, we had a whole team of people that made sure all the weapons were properly cared for. They were held for the actors between takes, touched up and repaired if damaged, and hero and stunt versions were swiftly swapped out for the appropriate shots. 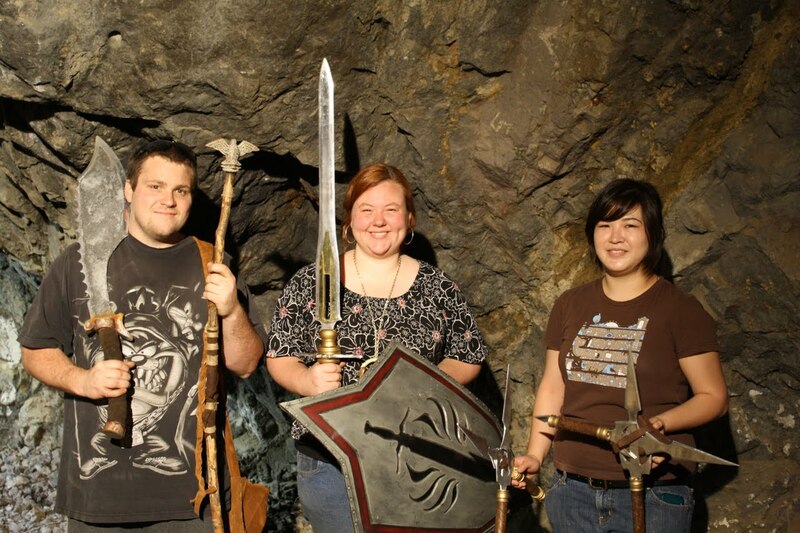 Here, Leo Nasca, Katie Moest, Kamela Lim stand by with the arsenal. 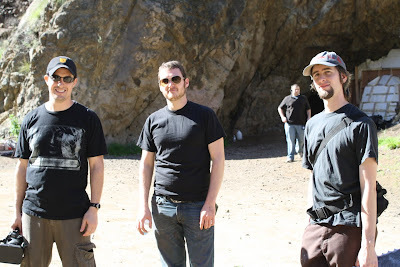 Photo 18: Outside the cave, Guild Director, and DA:R second unit director, Sean Becker, Bryan Fulk, and prop maker Kevin "Amish" Ivers take a break to see some daylight. It was hard to get your bearings staying in that dark and smokey cave all day! Photo 19: It was nice to step out side for a moment, especially since we had such a pleasant view! 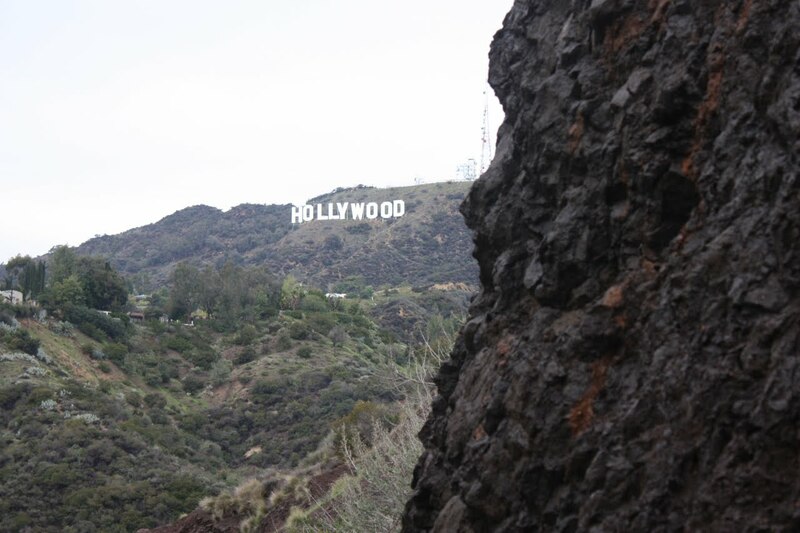 Nothing reminds you of the value of entertainment like the iconic Hollywood sign! It sits on the mountain overlooking Griffith Park, facing right toward Bronson Cave. That signal tower to the right of the sign is on the edge of the Disney lot, which rests just over that crest. 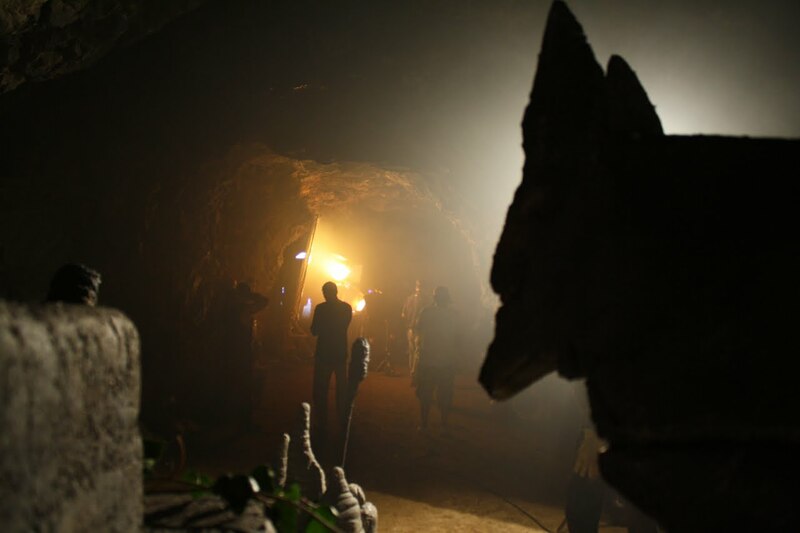 Photo 20: Things are not looking so great for our heroes inside the cave, though! Saarebas collapsed the mouth of the cave on them during the fight, and they are trapped inside. 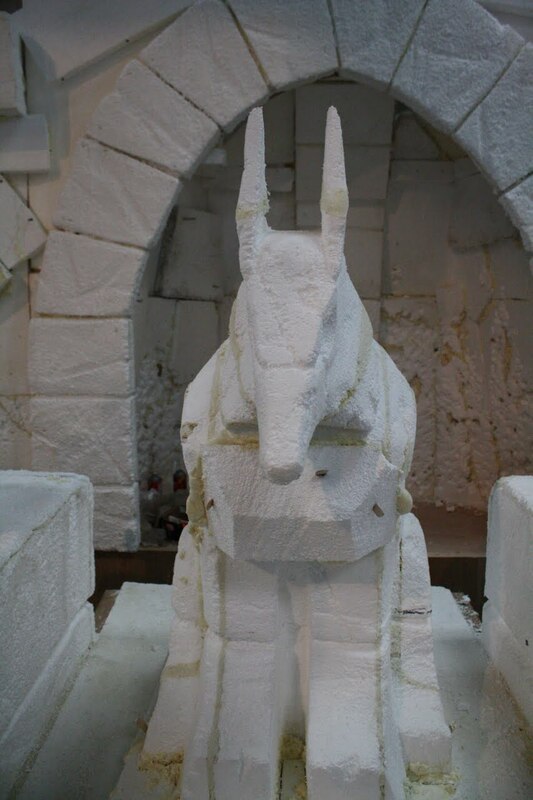 The "avalanche" was actually a collection of styrofoam chunks, coated in spackle, and painted to look like rock. I hope you are enjoying these blogs, as I am trying to give you as much detail as possible about what was happening behind the camera to bring this show to life. Leave me a comment, or ask a question about the show below. And like and/or share this page! I really appreciate it. Can't wait to show you around next week's episode. It's my favorite! Have a good weekend. Maybe I will see some of you at Long Beach Comicon! 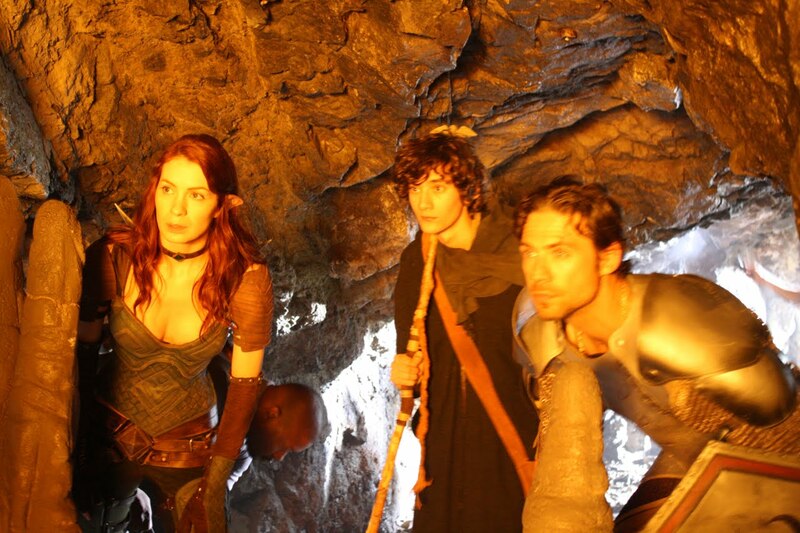 Photo 1: With the young Dalish mage joining our heroes, the group sets out to find Saarebas. But they find that he is still not alone. The reaver Nyree guards the enterance to the cave. Photo 2: There was a lot of back and forth in regard to how big the reaver's weapon should be, and I believed the bigger the better! The game asset we chose from the BioWare chart looked mean, but I wanted it to strike fear in people's hearts just sitting on Nyree's shoulder. We went pretty large, ultimately, but Marcia Battise make it look natural to weild, which made the weapon and warrior combo even that more impossing. 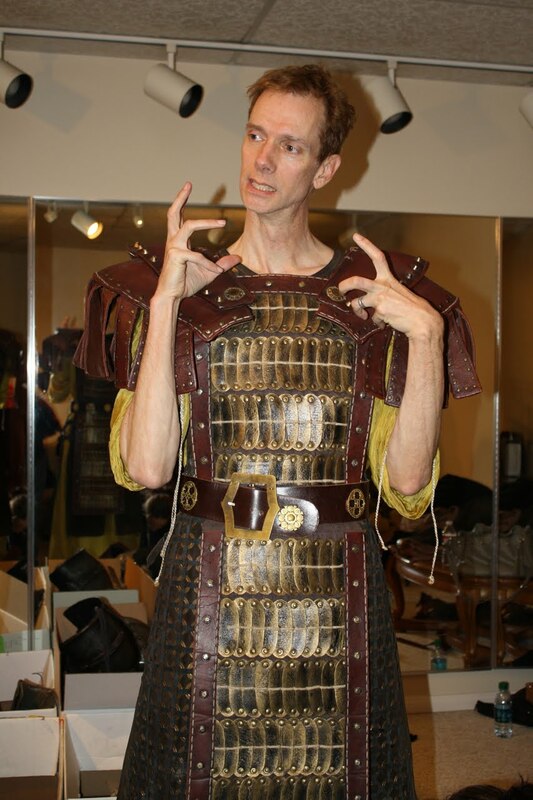 Photo 3: And once inside the cave, we finally get to see Doug Jones in costume designer Shawna Trpic's final ceremonial Saarebas armor. 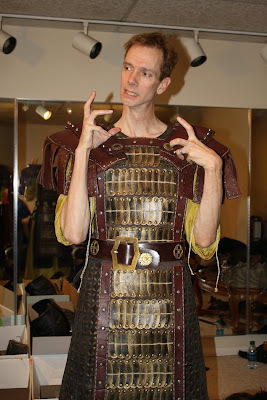 Here he is during the last fitting before the shoot started. Doug is the nicest guy you will ever meet in Hollywood. That whole evil hands thing is just an act! 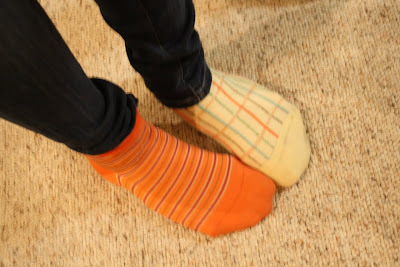 Photo 5: And yes, Felicia Day once again wore mismatched socks to the fitting! 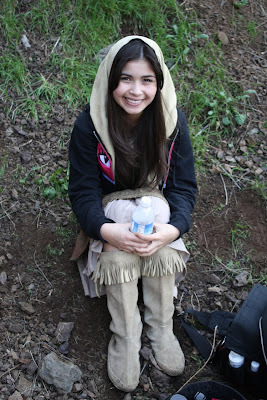 Photo 6: I am friends with the entire cast, but no one is more dear to me than the lovely Marissa Cuevas. When I signed on to DA:R, Felicia hadn't worked out the entire story yet. After getting the first script and seeing the role of Fina, I suggest that Marissa audition for it. I was so thrilled when Felicia replied, "Oh, no, I WROTE that role for her!" Photo 7: I'm sure you notice Marissa in many of my blogs. 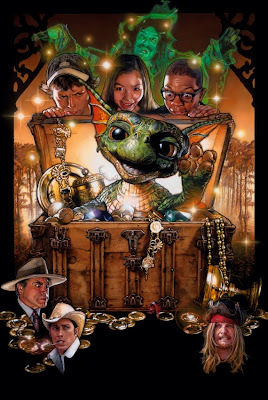 It's a long story as to how she became such an important person in my life and a major part of the BarnYard, but it all started with the first feature film I wrote and directed, LABOU . 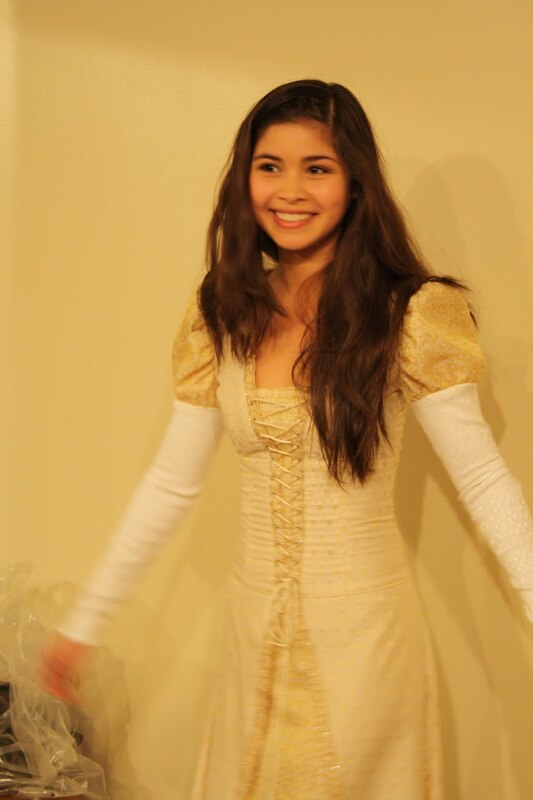 Marissa was only 12 years old when I discovered her while casting in New Orleans for the lead girl. We shot the film all summer long, right up until the morning Hurricane Katrina hit. The storm devestated the city, and destroyed many people's lives. We were very fortunate to survive the ordeal, but it did derail my movie, and it took almost a year to pull it all back together. The entire time, Marissa and her family supported me in every way possible, and were there to see the whole thing through. After the movie, Marissa had her sights set on making film her career, but New Orleans was in no shape to give the entertainment business a fair shot. So she packed up and headed to LA, and I have tried to help her succeed in every way I possibly can. Photo 8: Not that she needs my help! She is going to be a star, and there is no storm front strong enough to stop her! 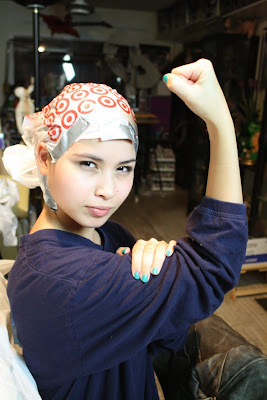 Photo 9: Marissa was the second pair of ears to get cast, after Felicia. See the irony of Marissa helping cast all the other elf ears now? 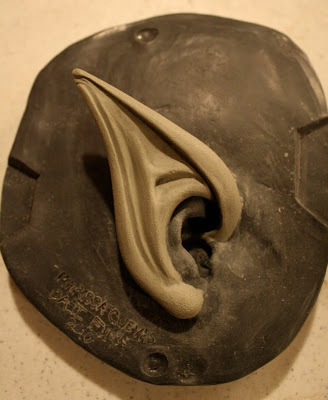 Photo 10: Here's a close up of Marissa's right elf ear sculpture. I decided to only apply the elf ear to the pinna, and not sculpt all the way to the inner ring. This allowed the foam ear to fit tighter and have a little more room for adjustment. You can also see Marissa's name and charater etched into the base. We had so many Elves, I needed to make sure that each actor's ears were perminately labeled so there wouldn't be any confusion in the lab. 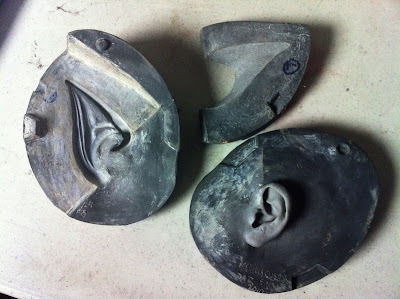 Photo 11: The elf ears were also one of those rare occations where the mold needed to be designed before the sculpt, so that everything was executed in a fashion that would work! Specifically since the molds needed to be run so many times. We couldn't afford for them to degrade, or get damaged in the process due to difficulty in use. Photo 12: Fina plays a major role in Saarebas's plan. In order for his blood magic to work, he needs the blood of a virgin! Photo 13: To procure that blood, the wicked mage uses a ceremonial dagger. 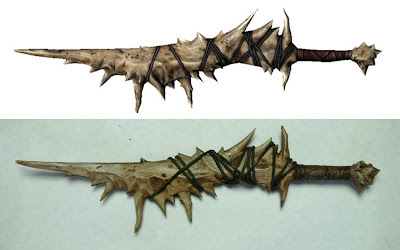 There were once again many choices on BioWare's Dragon Age II weapons chart, but the second we saw the shark jaw bone sword, I knew I had to shrink it down to be the mage's blade. Mike Laidlaw at BioWare agreed with the idea, and I didn't even have to beg! 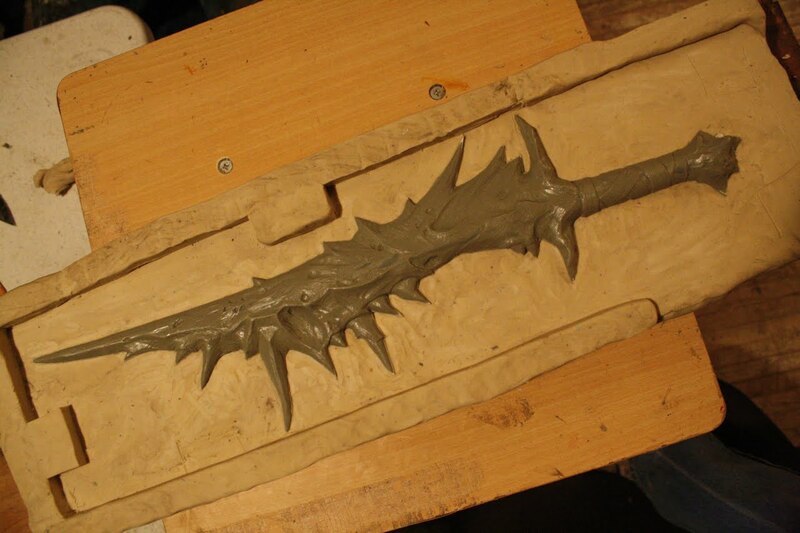 I sculpted the dagger out of roma clay. Here it is in its bed of leisure clay, getting ready for a silicone box mold. Photo 14: Despite the fact that Marissa watched me the entire time I sculpted and molded the dagger, I don't think it sunk in until she held the multiple urethane castings in her had. If I'm reading this photo right, she's saying, "Really!?!? I get sliced with this!?!?" Photo 14: Here is a comparison of the Dragon Age game asset, and my final prop. 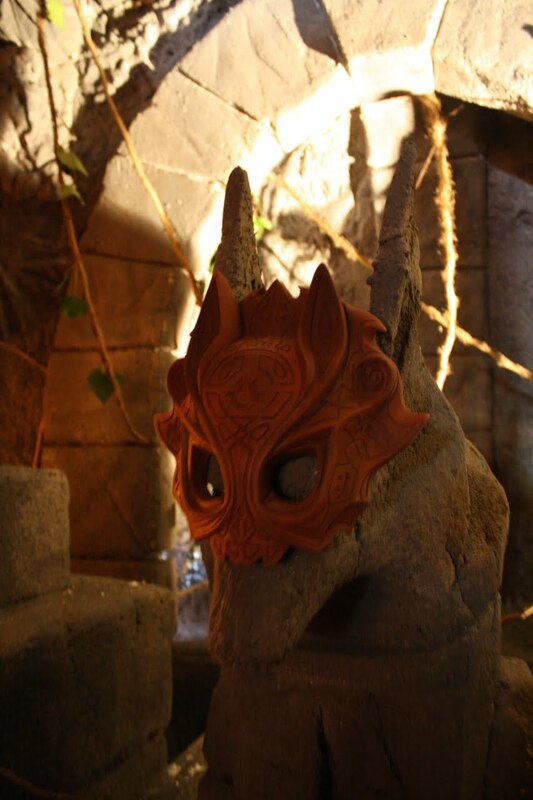 Photo 15: Saarebas uses the blood to awaken the magic contained within the sacred Mask of Fen'Harel, the dread wolf. 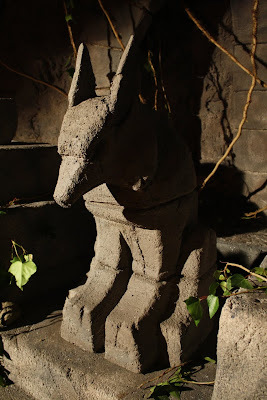 Photo 16: Fen'Harel is the god of trickery and decite. 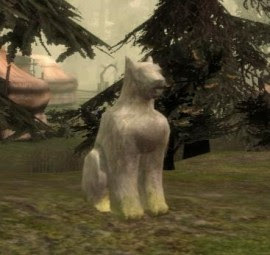 He is spoken of in DA lore, and the Dalish use this idol to protect their camps, but not much more detail is know about the god. Felicia penned the mask as a device within the story, but no such item existed in the game. This was one of the few oppertunites I had to create an original design. Photo 17: We had already seen the Dalish wagons and bows, and I knew that they were very ornate and detailed in there craftsmanship. Josmael stresses the mask's value in episode 2, so I wanted it to have a definite visual presence when we finally see it to support that statement. And, obviously, Felicia and I agreed it should look like a wolf! 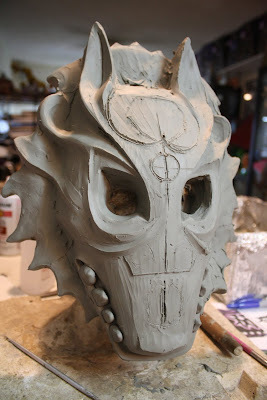 Photo 18: We were on a very tight schedule, only having just over a month to manufature hundreds of props, and I wasn't quite sure were I was going with the mask. Instead of figuring it out in sketches, which would only be an idea, I jumped right into clay and started exploring shapes and expressions. Once I felt like I was onto something, I sent the images you see above to Felicia and production for feedback. 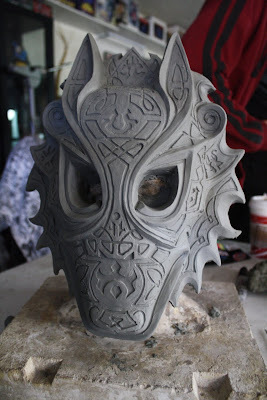 Photo 19: When everyone signed off on my rough sculpt, I spent a few days refining it, then carving in the Dalsih patterns and runes. 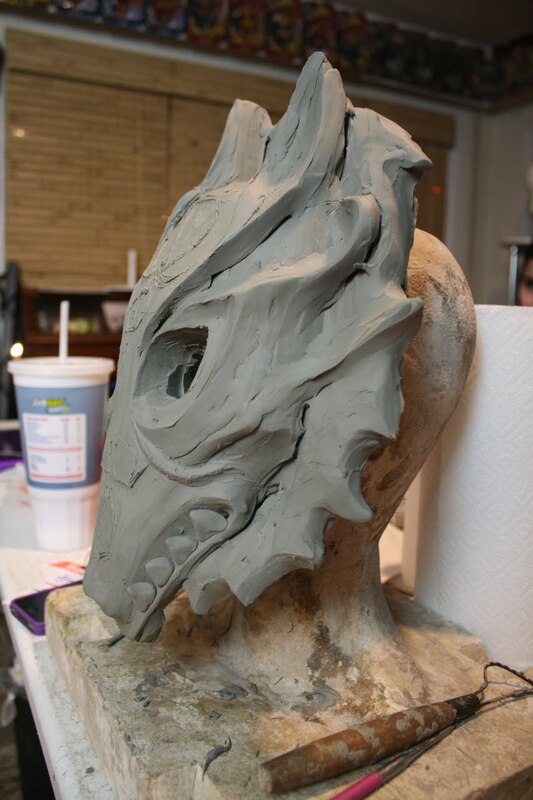 Photo 20: The sculpture was molded in an open faced silicone mold, and then a 1630 urethane brush-up was done. The final mask needed to be two pieces, the face and the jaw, and we needed multiple copies of each. So this first casting was a preliminary step. 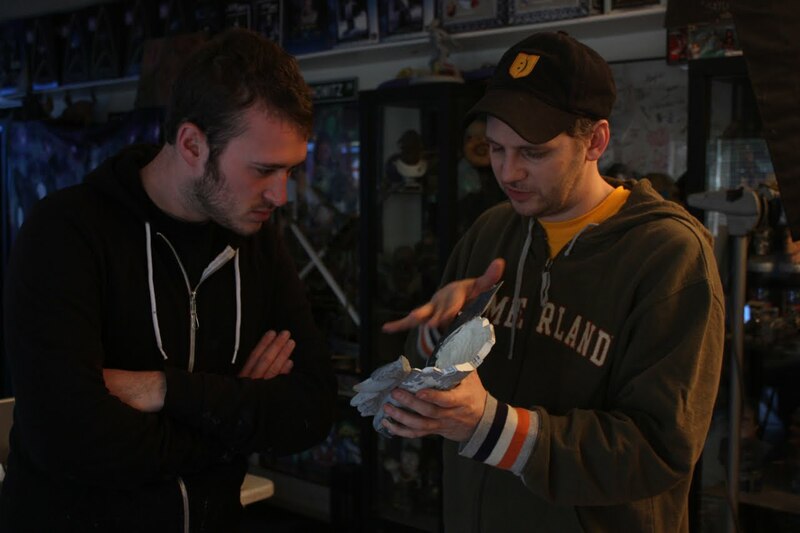 Here, I explain to Art Director Bryan Fulk how to divide the mask and finish of the back surface. Photo 21: After the mask was divided and finished, each piece was remolded as a two sided silicone mold. The final casts were done in a very durable BJB 808 urethane. 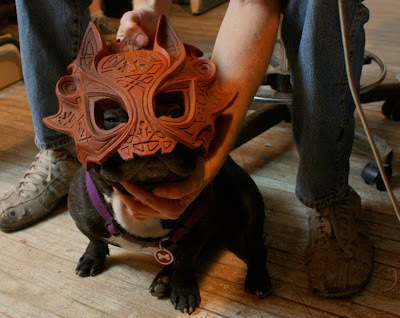 Everyone loved to run around with the mask on! 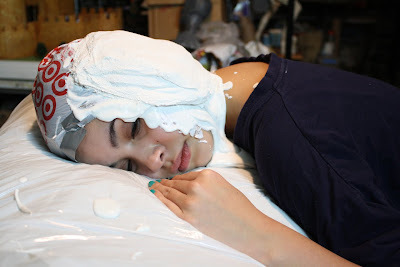 If this looks way too familiar, it's beacuse the sculpture was done on my head cast! 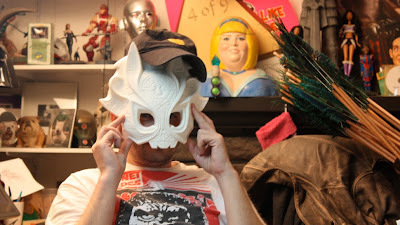 Photo 22: It was decided early on, for many reasons, that the mask would not actually be made of gold. A major factor being that on an item this big, gold paint would not look real. We couldn't afford the time to do any of the other trick processes that might get around this, nor the money to have the masks electroplated. 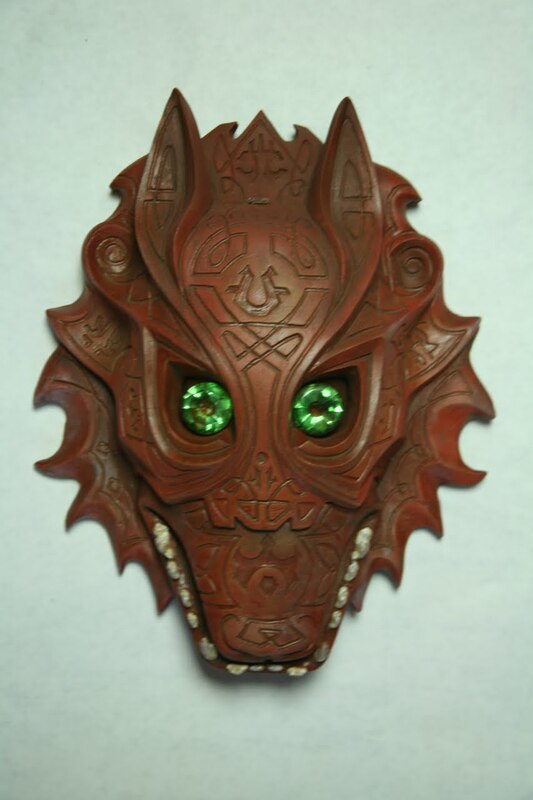 Storywise, it seemed important to keep the focus on the mask's mystical value, and not it's monetary worth. I felt terra cotta was the next best option for earthen people like the Dalish. Here, I'm painting the teeth to look as if they were real wolf's teeth set into the jaw. 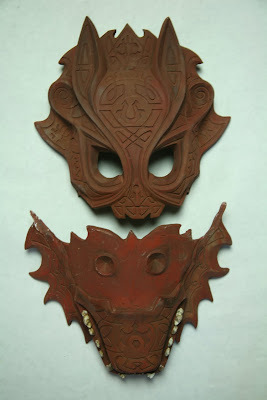 Photo 23: Here are the two components of the mask. The lower half was never meant to be seen on its own, as it magically grows from the mask during the ceremony. You can see the registration areas that lock into the upper half. Photo 26: The altar of Fen'Harel. 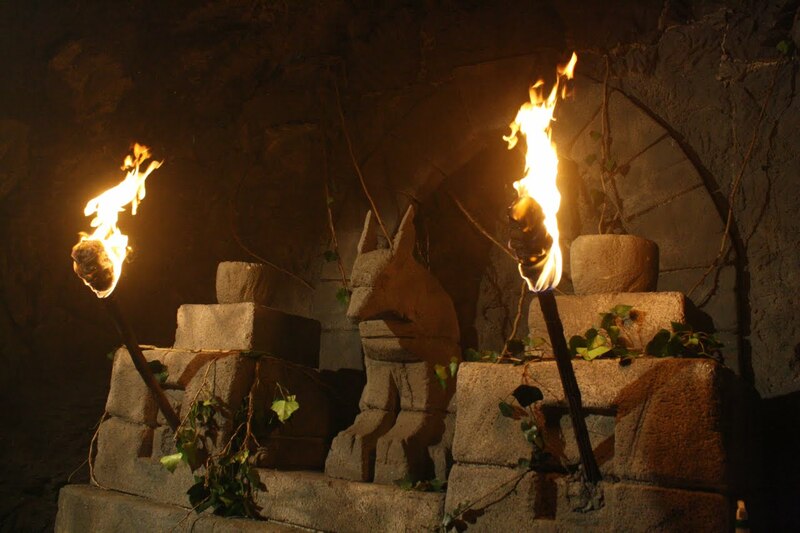 Hidden deep within a mountain cave, this wolf statue awaits a blood sacrifice. 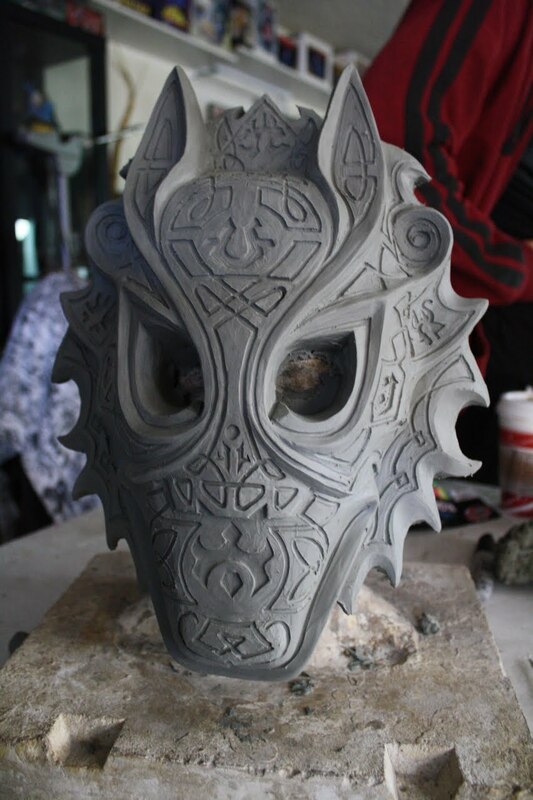 I originally had an elaborate plan of seeing the statue crumble when the completed mask was removed, revealing the skeleton of Fen'Harel's human form. Very Conan the Barbarian . Alas, there was no time for such a thing. 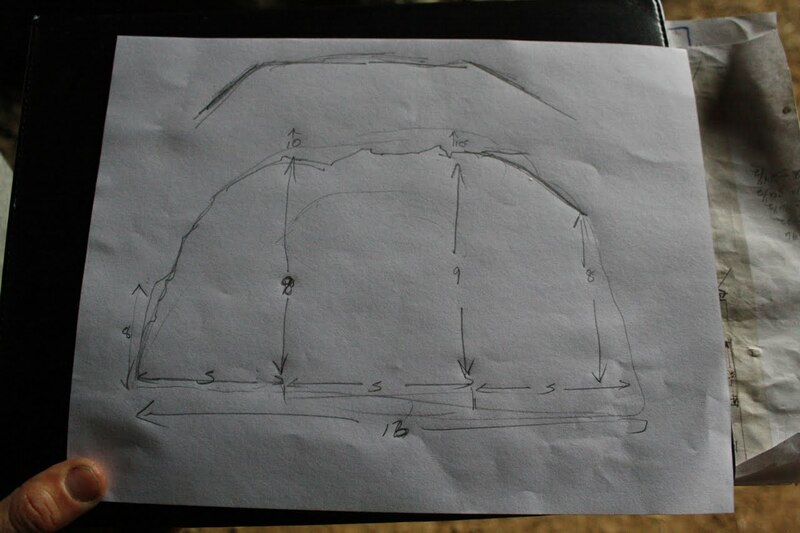 Photo 27: I did a quick sketch of the altar, and it was carved out of foam. 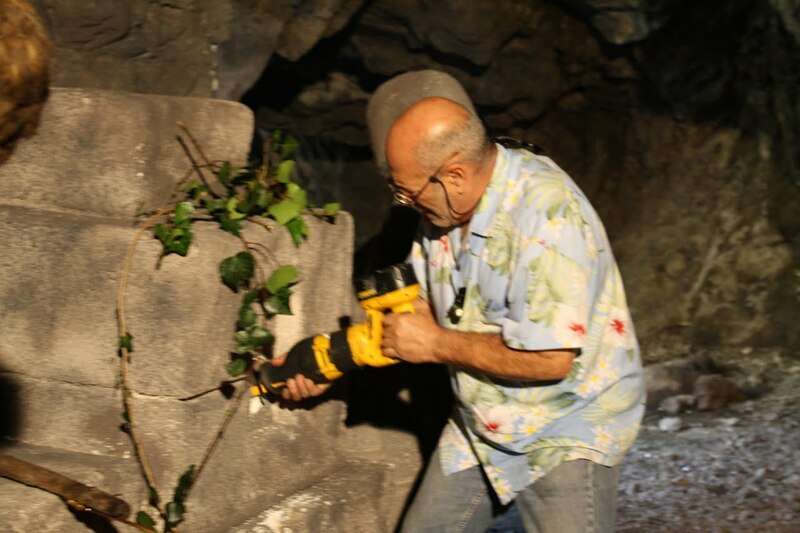 Digger Mesch did the dog, and Joanne Gross helmed the set piece. 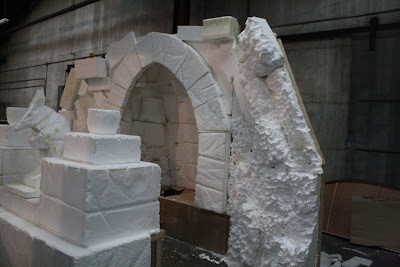 We didn't have the budget for giant blocks of foam like we usually use on studio movies, so mutiple layers were fused together with spray insulation to get the thicknesses we needed. For all the stryofoam people throw away on a daily basis, you would think the stuff was cheap. But large blocks of foam run in the thousands of dollars! Photo 28: The finished carving was coated in a layer of spackle, then a base coat of house paint was applied. The set piece was sceniced with a combonation of washes, dry-brushing, and splattering to give a stone effect. For large pieces like this, I use a hudson sprayer with thinned down house paint. If you open the nozzel all the way, it sputters and creates a realistic granite effect. Photo 29: Fen'Heral keeps an eye on the cast and crew in the cave. Which is actually the Bat Cave! Soooo, anyway. The funny thing about shooting at Bronson cave? It's not a cave at all! Photo 30: It's more like a tunnel...! Photo 31: ...with giant opening at both ends. 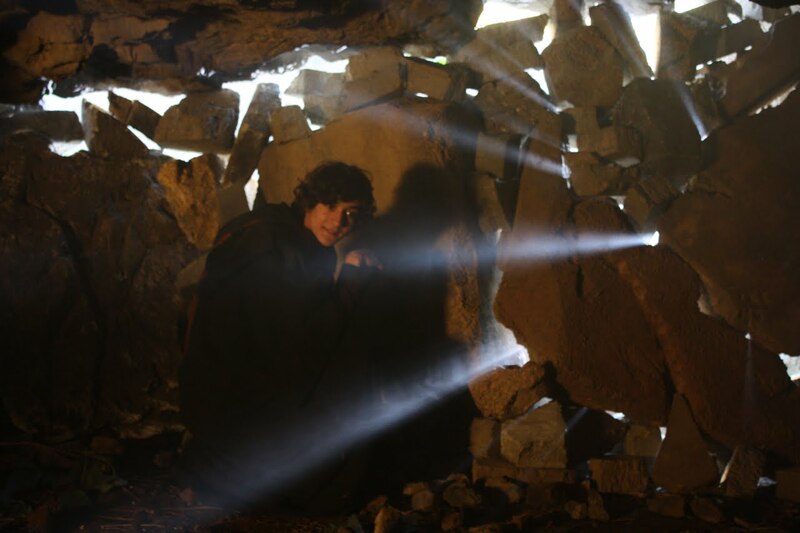 So the trick was to turn it INTO a cave. We decided to plug up the largest opening, so the smaller one could more easily be tarped of by the grip team. There was no small amount of obstacles to this task. The mouth of the cave was huge (You can see Joanne standing there for scale) the ground was loose and sloped, and we weren't allowed to dig, nail, glue, stake, or lean on any part of the cave! And to top it off, the way the mountain was positioned, the tunnel was a bona fide wind tunnel! It was hard to stand in the middle at times from the force of the air rushing through. Our styrofoam plug was going to need a well engineered support system to resist against that. 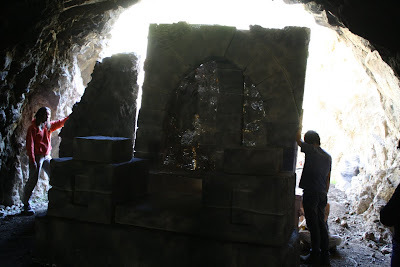 Photo 32: Joanne took basic measuments of the cave mouth, and set off to extend the altar to include cave walls. Photo 33: The beginning of the extended altar. 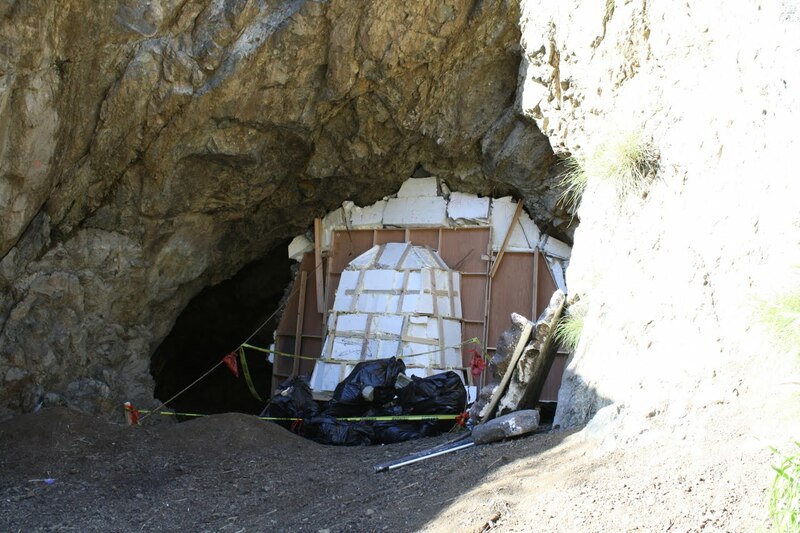 The "plug" needed to be built in sections so the individual pieces could be transported to the cave. 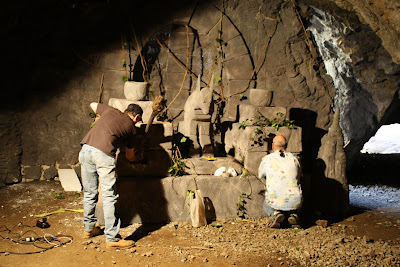 Photo 34: The altar was assembled in place, and the cave plug walls are being brought in. It took several days at the loctaion to get everything together and blended into the surrounding rock. 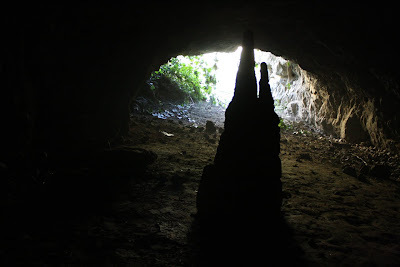 The cave is a landmark, and a tourist attraction, so even though we had permission to film there, we couldn't prevent people from entering during the construction days. It was amazing to me that people had absolutely no issues with walking right up and breaking pieces of styrofoam off the altar just to see what it was made of! While we were standing right there! Alright, there's been a lot more blogging than usual this month. But I can't help it! I want to share all the behind the scenes DA:R with you that I can. Obviously, there will be yet another entry for episode 3 by the end of the week. So much more ground to cover. Share this with your friends if you think they might be interested, and leave me your comments on episode 3! How about that Nyree?!? What are your thoughts on the series so far?